It’s one of the most familiar places in the solar system, near 24 hour day-cycles, mountains, valleys even liquid water. With so much in common with Earth you’d think Mars could be a second home for the human race, but you’d be wrong! Mars is a violent, inhospitable wasteland with nature firmly against you at every turn. But with that said, could humans live on Mars? From orbit, one thing is known for sure… Mars is dry. Although there is water ice and possibly even some flowing water, compared to Earth, Mars is a global desert. Not only is it dry, it’s also absolutely freezing cold — on the hottest days on the hardest parts of the planet temperatures can reach as high as 70 degrees Fahrenheit (21°C), that’s actually not bad. But considering the average temperature of the planet is negative 52 degrees Fahrenheit (-46°C) and with winter temperatures at the polls dropping to a bitter negative 225 degrees Fahrenheit (-142°C), most of the planet is in a perpetual state of frigid hostility. Humans can survive in cold climates, however. The average temperature of Antarctica is about negative 57 degrees Fahrenheit (-50°C) — which is actually cooler than the average temperature of Mars and we have a sustainable camp there, so, although it won’t be easy to stay warm on the martian surface, it is technically possible with current and near-future technologies. But still, you’ll have to plan your landing site accordingly. Entering the atmosphere of Mars introduces a unique problem. The martian atmosphere is extremely thin. This means that air-resistance for entering spacecraft have less help slowing down as they descend to the surface. But this also means that there is little to no oxygen to breathe. In fact, the atmosphere is only about 0.14% oxygen compared to the 21% seen on Earth. There is light at the end of the tunnel, however. A chemical called perchlorate is found in high concentrations on the surface of Mars. This molecule consists of one chlorine atom and 4 oxygen atoms. Some oxygen atoms can be stripped away and collected giving the astronauts a possible source of breathable air inside the habitat. On the downside, perchlorate is extremely toxic to humans. When it’s absorbed, it interferes with metabolic functions… this leads to poor temperature regulation, sleeping disorders and certain blood diseases. Today, there is no guaranteed way to keep this chemical dust from entering a habitat and into the lungs of any human inside. However, if there is a way to safely live in an environment with perchlorate then it can be leveraged as an enviable resource for the crew. 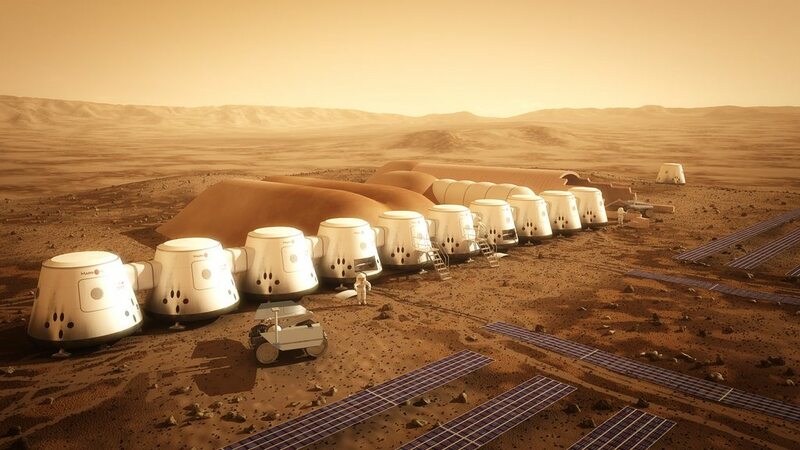 A colony on Mars.©Mars One/Bryan Versteeg. One of the biggest dangers for anyone living on Mars is radiation because the Earth has an active iron-core, a strong magnetic field is generated. This magnetic field shields the planet from harmful radiation, not only from the Sun but also from violent distant activity from deep space. In fact, in 2004 the largest single ray gamma blast impacted Earth from a Magnetar about 50,000 light-years away. It released more energy in one tenth of a second than our sun has released in one hundred thousand years. Unfortunately Mars has little to no magnetic field, so it’s almost completely exposed to the elements from space. Still, during a standard 180 days journey to Mars, the astronauts would have absorbed the same levels of radiation as a nuclear power plant worker will in a 15 year career. Once on the planet, the crew would continue to receive a constant low dose of radiation increasing their risk of cancer further. Even with advanced shielding technologies and the Earth’s magnetic field, radiation still poses a great risk for the crew on the International Space Station. Therefore, until radiation shielding techniques advance further, living on Mars will have to be scaled back to only a short visit. It isn’t until you look at Mars, a seemingly earth-like planet that you realize just how narrow the habitability zone for humans actually is. Although we have technologies to get humans to Mars, on a planet that’s one and a half times further away from the Sun than Earth… and 225 million kilometers from Earth… with toxic soil, a scarce water supply and dust storms the size of North America you have to question whether it’s even worth it. For some, it will be. And in the next 20 to 30 years the technology will be in a place to help support human life on the planet, but today, it is simply too far away and too hostile for a sustainable human colony on the red planet. Sorry folks, you’re just gonna have to wait a little bit longer. X-ray technicians must be required to receive anti-X-rays!